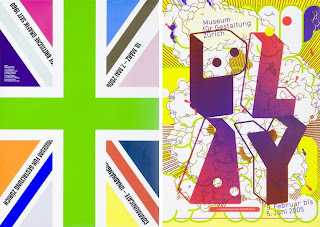 Carnegie Mellon University has a nice archive of Swiss poster design from 1971 through the present. The collection is categorized by subject and style, and contains a good variety of works that utilize a traditional grid-oriented approach, as well as contemporary postmodern techniques. I like the overall collection, but the site has two negatives. First, the layout is pretty bad. Why present some of the most interesting, well-designed posters of the past 40 years in such an uninspiring manner? And second, the images are quite small — at their current size, it’s difficult to appreciate all of the detailed work. Despite these flaws however, it’s a nice resource, and certainly bookmark-worthy.